Be sure to set up your stations prior to completing this activity. I placed two pictures per station for a total of seven stations. Each picture symbolizes something important to keep in mind when assuming the responsibility of caring for a child or children. 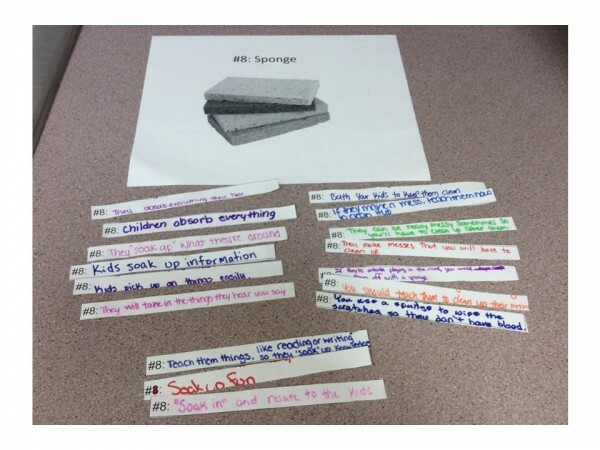 Introduce the activity by showing students a sample of what they will be doing. Show them a photo of a Nestle Treasure candy and have students think outside the box as they brainstorm the meaning. Share ideas orally and then show them what I was thinking since this is an example. There are no right or wrong answers! Pass out the answer strips and colored markers or pencils to students and have them circulate the stations to complete their brainstorming. 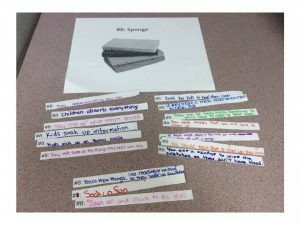 After students have circulated and brainstormed their answers on the strips for each picture, have them cut the strips apart with scissors. Count students off by 7’s so there are at least 2-3, maybe 4 students per station. Send students to their assigned stations by number. Once there, students introduce themselves if necessary and share with each other the ideas they brainstormed for the picture and their reasoning. Students place their strips under the picture and repeat the process with the second picture at the station. Students will have about 2-3 minutes before rotating to the next station. Ultimately, they will end up where they started. Now, once they are back where they started, they are to read through all of the strips found underneath the pictures. They are to organize the strips by similar responses, themes, ideas, etc. Students are to discuss and be prepared to share the 3 most common meanings for each of the pictures at their station based on the content of the strips. As I pull each picture up on the screen from the PPT, students will share their 3 most common meanings for their assigned pictures. Continue until all pictures/groups have been shared. Encourage students to listen carefully as they will need to utilize all of this info before they leave. Provide each group of students one index card. As a team, they must decide on the single most important thing to remember about children, based on today’s discussion and write the answer to the prompt on the index card. All team member names must also be included. Thanks for another great lesson! I can’t wait to use it for an intro next week! Did you make an answer key of more suggested responses for each symbol? There are no specific correct answers for this activity. I do stress that they think “outside the box”. 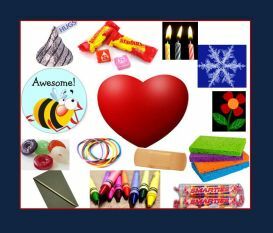 Some ideas for some of the objects could be as follows: snowflake-every child is unique, tooth pick–pick out the good qualities, crayons–color their world, starburst–children are a burst of energy, rubber bands–the need to be flexible, etc. It depends some on your students but I have 43 minute classes and usually it takes about 1 to 1 1/2 periods to complete. Students can usually get through the stations and the processing but sharing and the final prompt often go into the second day.